Poshmark started offering the Wholesale Portal as a way for sellers to buy small quantities of inventory to resell in their closets. It is easy to be approved to shop the Portal and was intended to be an easy route for beginning resellers to source inventory. Right now, Poshmark is even sweetening the deal by offering free shipping through May 15th for your first Portal order. Go to your Settings menu and click on Retail Tools > Retail Certification. Complete the certification, then you will be able to access the Wholesale Portal under the Retail Tools menu. It sounds great at first! You can buy in packs of 5, for as low as $15. Considering many wholesalers have minimum orders of $1,000 or more, this can be an easier way to get your feet wet with retail. These are also items that definitely qualify to be listed as “Retail”. The difference between Retail and NWT listings is basically where you bought the item from. If you bought the item from a retail store, it is NWT. But if you buy the item from a wholesaler or a fashion supplier that sells to businesses for resale, the item qualifies as “Retail”. Another benefit of the Portal is that Poshmark is a trusted platform and, if you have already been making sales and/or purchases, you know how they work and that they have your back. Since you already have a relationship with Poshmark, it’s less stressful to place your first wholesale order through them. Keep in mind that Poshmark will still take a 20% fee from your sale, even if the item came from the wholesale portal. This eats into your profit significantly. If you take the classic retail approach of doubling the wholesale price, then you are making a 30% profit on the final sale. And that also assumes that you didn’t end up accepting a lower offer. Items in the portal are still kind of expensive for “wholesale”. The MSRP will still usually be at least double the wholesale price, but when you see suggested retail prices like $38 for a plain t-shirt from an unknown brand, it may leave you scratching your head. The majority of buyers on Poshmark are looking for deals. Sometimes, they are looking for rare or hard to find pieces and are willing to pay top dollar for them, but those buyers are fewer and those pieces are super specific. So the high retail prices of the Portal items just doesn’t seem to fit with the mindset of buyers on the app. It does fit with sellers who want to make money though. When they see the high retail price, they might only see that as a lot of potential profit and not consider whether or not they can actually resell the pieces for that much. And if those pieces don’t sell, then you have actually lost money as a seller. Since it’s super easy for sellers to get access to the wholesale portal, there will be a lot of competition. If you want your inventory to move, then you will need to beat other sellers’ prices, which also minimizes your margins further. When Poshmark first launched the wholesale portal, there was so much interest from sellers, that everything sold out right away. There are many more offerings now, but the better items still get picked over pretty quickly. The wholesale portal brands are more indie brands and not necessarily things buyers are specifically searching for. If you have built up a closet with tons of followers and have significant influence, then you can probably still push items. But for the most part, they aren’t quite as discoverable, especially to new buyers in the app. I have stayed away from the wholesale portal myself. The prices are too high and I don’t feel like I could resell these items for enough profit for it to be worth my time. I have also talked with many sellers who bought items from the Wholesale Portal and still haven’t been able to resell them. And that is while other pieces in their closet are still moving, so it’s not like their sales have dried up completely. On the other hand, I have heard of a few sellers having success with the Wholesale Portal. I think it really depends on how you have branded your closet and built up your follower base. Are people looking for a specific brand in your closet? Do buyers come to your closet frequently to browse and see what you have curated? Are you making random sales from people discovering your items through the news feed? The best scenario where your closet will be a good fit for carrying Portal items is if buyers are frequently browsing your closet. The wholesale items available are cute and Poshmark makes sure the vendors in the Wholesale Portal are meeting modern style needs. 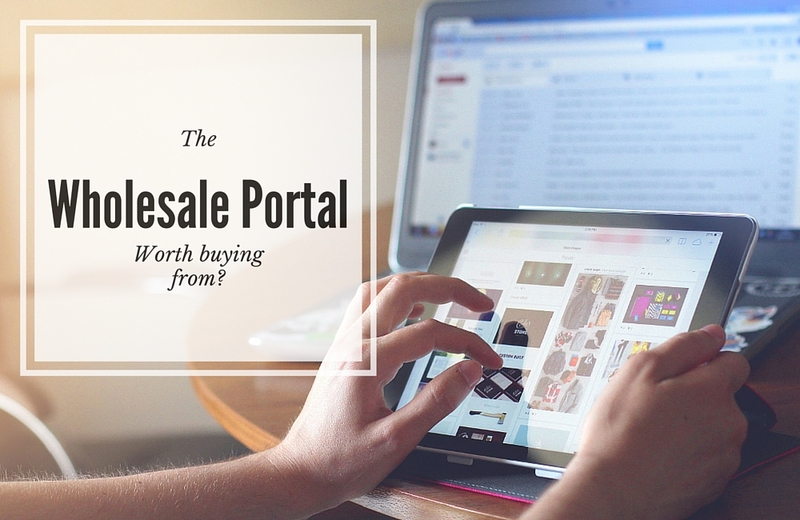 So carefully think about who your buyers are and how you will get items to move if you make a Wholesale Portal purchase. Have you already made any purchases from the Wholesale Portal? Was it a success or a dud for you? Are there any Portal brands that you are particularly interested in? Let me know in the comments! Thank you for the great information and review. I think you may have saved me some money! I am leery of keeping too much inventory for my online store. I really prefer, when possible, not to hold inventory. Do you have any recommendations on affiliate programs for clothing items that wouldn’t require an inventory purchase? I know the profit margins wouldn’t be the same but the risk is much lower also. One other question is what about “MADE IN USA” product? Would you have any leads on made in usa clothing? I like to sell made in usa product whenever I can. Thanks for stopping by! If you are not selling clothing through the Poshmark app, then you can do dropshipping. I just heard about Bella Vi a little while ago, but have not personally used them. However, if you sell anything directly through Poshmark, they generate and provide the shipping label and expect items to be shipped in about 2 days, so it typically requires you to have inventory on hand. I have been looking for ways to make a little income without spending a lot of money and this has been very informative. My daughter is such a skeptic, so I am going to send her here so she can see for herself! Heading over to your closets now! That’s awesome! Thanks for stopping by Cynthia! At first, I thought I didn’t have many of my own clothes to list, but once I started making sales, I got really excited and cleared out a ton of stuff from my closet. This article was super helpful! It’s nice to hear honest opinions. I haven’t yet used the wholesale portal but my curiosity will probably get the best of me. I will probably start with small jewelry to be cautious. Thanks! I think that’s a great idea to start off with a smaller purchase! It’s definitely worth trying out as some sellers on Poshmark have had good success with reselling what they buy from the wholesale portal. I think it was the ones who jumped into it without researching their purchase that got stuck with inventory that they couldn’t move. Some of the sellers in the wholesale portal are actually reselling items that they get from other true wholesale companies. But there are many that design and make their clothes or jewelry themselves. I know @functionfringe is one of the reputable sellers in the wholesale portal. She designs and makes all of the jewelry herself. Do you have any information about how I can become a wholesaler on Poshmark? That’s a very good question! I’m not sure of a direct contact, but I would email support@poshmark.com about how to become a wholesale supplier in the portal. They should be able to direct you to the right person to talk to. They say they require wholesalers to design their own offerings and that they aren’t supposed to just buy wholesale from somewhere else and then sell it as “wholesale” again through the portal. I think some wholesale sellers still get away without designing their own inventory though. I’ve also heard that Poshmark suggests having at least 6-7 styles to offer and about 50-75 units per style, but that it’s not a hard requirement. Thank you so much! I just got access to the portal today (with free shipping!) and I’ve been debating what to do. I think I might try it out, I found something for not too much money just to try to get my feet wet. I really appreciate it! I also just followed your closet on Poshmark- you have really cute stuff. I have been debating whether or not to purchase from the wholesale portal and this article validated some of my concerns – thanks so much! There are definitely a few brands in the wholesale portal that you can probably turn around and sell for a profit, but I think the majority of them are hurting the rest of us sellers. Good luck with your Poshmark sales! Hi, I was a buyer for 15 years for a Women’s specialty chain store. I left the industry recently to have a family and thought I could make little extra money on poshmark. I was so excited to start using the wholesale portal and star building my very own online boutique but because of my knowledge in manufacturing I know what things actually cost and what prices wholesalers should be selling for. Right away I noticed these prices are high but thought even if there was a 30% profit it was a profit but it’s not possible if you buy from the portal and I feel that people are new to buying wholesale are getting completely taken advantage of. When I questioned 1 of the wholesale portals about the fact that there prices didn’t make sense they got completely defensive and blocked me! Im not buying from the portal but I feel terrible for the new aspiring poshers that are getting totally taken advantage of. Thank you for your thoughts on the wholesale portal! I’m glad to hear from someone who has professional experience in the fashion industry. I bet you know of some really good places to get inventory with your background (that aren’t alibaba lol). I love keeping Poshmark around for extra side money, but I have a couple of other side gigs going to even out the dry spells. When selling wholesale does poshmark charge sales tax? If not how do you file. I heard poshmark doesn’t provide a 1099. Just wondering how to pay taxes on the sales tax portion for sales. It doesn’t look like Poshmark charges sales tax for wholesale purchases. As for how to file for sales tax, that may be different for every state. Look up your states Sales & Tax Commission to find their Sales and Use Tax policies. It may also help to consult with a local tax attorney to make sure that everything is handled properly. Great article! I’m new to Poshmark, just started in November, and had a lot of success selling my own items and items I’ve found at the Thrift stores. I ended up buying some stuff off the wholesale portal back at the end of November. I have to date only sold 1 piece from my wholesale listings. I’ve continued to have a ton of sales on my other items. Selling something almost everyday last week! I probably need to have a bit more patience but I don’t think my wholesale items will sell. I’ve already marked them down. I will probably stick to the thrift stores. I find such cute items and so many are brand new with tags for only $3-$5! I think the profit potential is much greater with those items. I’m considering purchasing from the wholesale portal. I’m wondering if all the pieces that are purchased have to be resold through Poshmark or can I resell some pieces elsewhere? That is a very good (and important) question. Yes, any time you purchase something and resell it for a profit, then it needs to be reported as income. That applies to anything purchased through Poshmark’s wholesale portal or anywhere else. The safest thing to do is to look up how to register a business in your state and check if you need an additional retail license. Once you have a retail license, then you can purchase inventory directly from other wholesalers as well. One other thing to be aware of is that you may be responsible for handling sales tax for sales made to customers living in your own state. Hope that helps! Such an insightful article! Honestly, thank you for the input! It really helped me put into perspective how I could help improve my closet and the steps I need to take. Thanks for your kind words Whitney and good luck with your Poshmark sales!